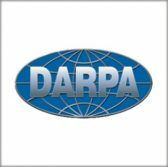 The Defense Advanced Research Projects Agency‘s Microsystems Technology Office has issued a request for information on methods to develop radio frequency personality systems. DARPA said Friday in a FedBizOpps notice it aims to build a phased array apperture for a backend digital receiver/exciter concept that the agency wants to integrate and test-fly with the Air Force Research Laboratory’s intelligence, surveillance and reconnaissance pod called AgilePod. Interested parties can submit input on the ACT-IV Puck Aperture effort through Nov. 12. The agency noted that RF personalities work by transitioning free-space signals from and to the DREX backend system intended to convert the analog signal into a digital form. Such a digital architecture has the potential to support radar, signal and electronic intelligence collection, communications and electronic warfare missions, DARPA added.